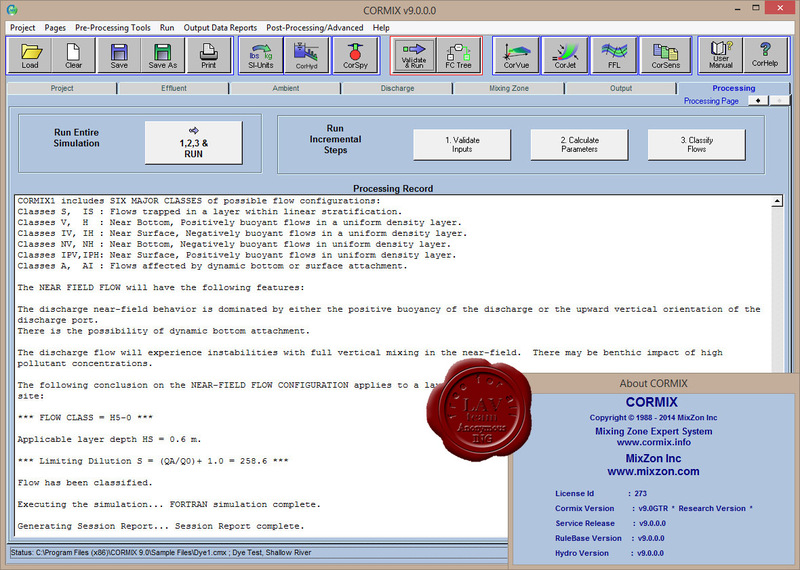 CORMIX is the most comprehensive tool available for mixing zone modeling and analysis, wastewater outfall design, optimization, management, and monitoring. CORMIX has improved capabilities for modeling drilling muds and cuttings discharges from offshore oil and gas operations. The new version includes an updated CorPlot tool which can be used to graph bottom sediment deposition plots and other 2D/3D graphics that help with the analysis of model results from simulations of discharges during typical drilling operations. The model and post processing capabilities have been updated and improved to be able to perform time series analysis of depth varying ambient conditions usually encountered during such offshore operations. CORMIX v9.0 GTR has now been updated to dynamically couple with a Far-Field model like Delft-3D FLOW. The coupling allows for the dynamic linking of the two models, communicating and running concurrently on different computers. The CorHyd multiport diffuser design tool with advanced graphics and hydraulics analysis has been updated to support most common wastewater discharges, including vertical multiport diffuser designs.